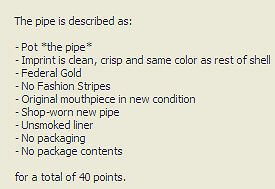 The value of pipe #734 is 40 points. Mike Colgan (mjc1231) offered three lots of the pipe and THE SMOKE pipes on eBay. Bidding was pretty intense, but I was lucky enough to win all three lots. Although the descriptions called them "new" it turned out that only two of them were. Even so, most of them joined the collection because the restorations are excellent. The others will join the Pipes for Trade page. This one will remain in the collection. This was such a nice pipe that I fully intended it to remain in the collection forever, but, as good luck would have it, a NIB example came my way and so this one, perfect as it is, goes to the Pipe for Sale page. Alejandro Claude nabbed it.